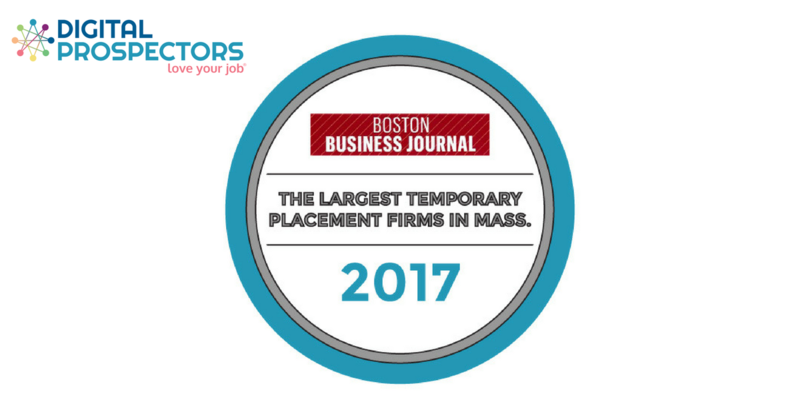 For 3rd Year in a Row, Digital Prospectors Listed in BBJ’s “Largest Temporary Placement Firms in Massachusetts” List! For the third year in a row, Digital Prospectors has been recognized on the “Largest Temporary Placement Firms in Massachusetts” List by Boston Business Journal! The results were determined by the average number of temps supplied daily in Massachusetts. This year, Digital Prospectors was listed at #15. According to the Boston Business Journal, Digital Prospectors supplied, on average, 175 temps each day in Massachusetts in 2017. Digital Prospectors is proud to be considered one of the best staffing agencies in Boston. Digital Prospectors has placed thousands of employees and contractors with companies across the United States, but New England is our home and we are so proud to be such a trusted provider of temporary workers in the state of Massachusetts. “Our goal at Digital Prospectors is to connect candidates with jobs they truly love. There is no better place than Massachusetts to be working with the best and brightest technical talent on a wide variety of exciting contractual opportunities, contributing to the State’s booming Tech scene and economy,” said Eliot Jackson, Senior Technical Recruiter. We couldn’t do this without our top-notch clients and uniquely talented contract workers, so on behalf of all of us here at Digital Prospectors, we want to extend a huge thank you!